The Hilton Paris Opera officially reopened yesterday (21 January), unveiling a £33m new look. Each of the 268 guest rooms and suites, several bars and restaurants, and the meeting and event spaces have all been given a "sophisticated" makeover that pays homage the to hotel's storied history, which dates back to 1889. Previously the Concorde Opera Paris, the property is located within the Right Bank’s Opera district, a short distance from the Champs-Elysées. Hilton announced plans to rebrand and renovate the property following its acquisition by Blackstone Real Estate Partners Europe. Simon Vincent, EVP and president, Europe, Middle East & Africa at Hilton Worldwide, said: "France has the largest inbound tourism market in Europe, estimated to reach 100m by 2018, with Paris itself remaining one of the world’s great destinations. Hilton has a long history in the city and we are delighted to be bringing one of its most illustrious hotels back to life, following a stylish renovation that will ensure Hilton Paris Opera becomes a home for Parisians and international guests alike." 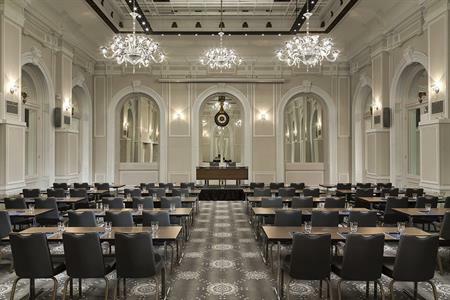 The hotel offers six meeting rooms, including 180-capacity Baccarat ballroom and Le Grand Salon. Rob Palleschi, global head, full service brands, Hilton Worldwide, added: "After much anticipation we are ready to welcome guests to one of Paris’s landmark hotels, beautifully renovated to reclaim its place in this remarkable city. Hilton has hosted many of the world’s great events and occasions for nearly 100 years and we look forward to creating many more special memories for our guests at Hilton Paris Opera."